The Hidatsa are a Siouan tribe living, since first known to the whites, in the vicinity of the junction of the Knife and Missouri Rivers in North Dakota. 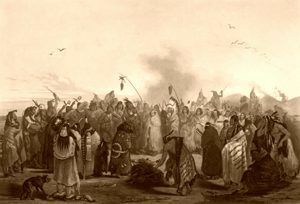 Although having a long-standing connection with the Mandan and Arikara, their language is closely akin to that of the Crow, with whom they claim to have been united with before the historic period. At this time the two tribes separated due to quarrel over the division of game, the Crow then drawing off farther to the west. The name Hidatsa has been said, with doubtful authority, to mean “willows,” and is stated to have been originally the name only of a principal village of the tribe in their old home on Knife River. It probably came to be used as the tribe name after the smallpox epidemic of 1837 and the consolidation of the survivors of the three villages. By the Mandan they are known as Minitarí, signifying “they crossed the water,” traditionally said to refer to their having crossed Missouri River from the east. The Sioux call them Hewaktokto, said to mean ‘”dwellers on a ridge,” but more probably signifying “spreading tipis,” or “tipis in a row,” the name by which they are known to the Cheyenne and Arapaho. 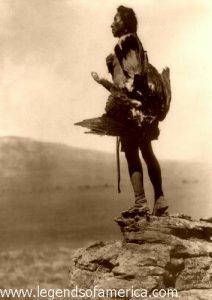 The Crow call them Amashi, “earth lodges,” and at the turn of the century they were officially known as Gros Ventre, a name applied also to the Atsina, a detached tribe of the Arapaho. According to their own tradition, the Hidatsa came from the neighborhood of a lake northeast of their later home and identified by some of their traditionalists with Mini-wakan or Devils Lake in North Dakota. 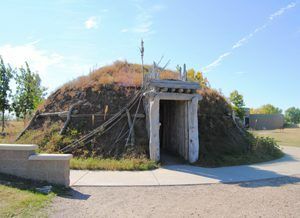 There they had the circular earth-covered log house, which was also used by the Mandan, Arikara, and other tribes living close along the upper Missouri River, in addition to the skin tipi occupied when on the hunt. After repeated attacks by the Sioux, they moved southwest and allied themselves with the Mandan, who then lived on the west side of the Missouri River, close to the mouth of Heart River. The three tribes, Hidatsa, Mandan, and Arikara were all living in this vicinity about 1765. From the Mandan the Hidatsa learned agriculture. Sometime before 1796, these two tribes moved up the river to the vicinity of Knife River, where they were found by Lewis and Clark in 1804, the Hidatsa being then in three villages immediately on the Knife River, while the Mandan, in two villages, were a few miles lower down, on the Missouri River. The largest of the three villages of the tribe was called Hidatsa and was on the north bank of Knife River. The other two, Amatiha and Amahami, or Mahaha, were on the south side. The last named was occupied by the Amahami (Ahnahaway of Lewis and Clark), formerly a distinct but closely related tribe. In consequence of the inroads of the Sioux, the Amahami had been so far reduced that they were compelled to unite with the Hidatsa, and have long since been completely absorbed. The three villages together had a population of about 600 warriors and about 2,100 total members. Of these, the Amahami counted about 50 warriors. There was no change in the location of the villages until after the terrible smallpox epidemic of 1837, which so greatly reduced the Indian population of the upper Missouri River that the survivors of the three villages consolidated into one. In 1845 the Hidatsa and the remaining Mandan moved up the river and established themselves in a new village close to the trading post of Fort Berthold, on the north bank of the Missouri River. In 1862 the Arikara moved up to the same location and the three tribes occupied a reservation on the northeast side of the Missouri River, including the site of the village. In 1905 the Hidatsa were officially reported to number only 471. Early writers describe the Hidatsa as somewhat superior intellectually and physically, compared to their neighbors, although this was not so evident in later days. In home life, religious beliefs and customs, house building, agriculture, the use of the skin boat, and general arts, they closely resembled the Mandan with whom they were associated. Their great ceremony was the Sun Dance, called by them Da-hpi-ke, which was accompanied with various forms of torture. Their warriors were organized into a number of military societies, as is the case with the Plains tribes generally. Today, the Hidatsa are a part of the Mandan, Hidatsa and Arikara Nation, located in New Town, North Dakota. Compiled and edited by Kathy Weiser/Legends of America, updated October 2017.